Were you too hung over from Friday night’s festivities that you weren’t able to wake up early this morning to watch “UFC on FUEL TV: Franklin vs. Le” go down in China? Are you regretting it because you wanna see what the entire MMA world is still buzzing about? No worries, because our partners at FOXSports.com have provided the devastating footage to get you up to speed. 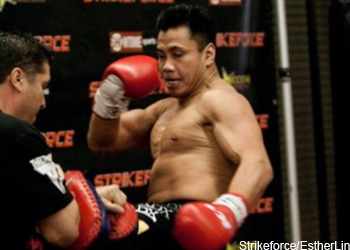 In the show’s featured contest, Cung Le (Pictured) knocked former UFC middleweight champion Rich Franklin completely unconscious with one nasty right hand. FYI – Franklin was a 3.5-to-1 odds-on favorite entering the shootout. UFC on FUEL TV 6 took place inside Cotai Arena in Macau.